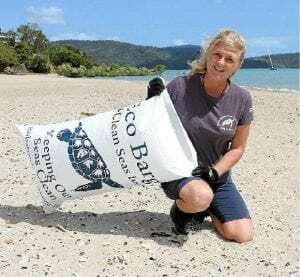 About Us | Eco Barge Clean Seas Inc.
Eco Barge Clean Seas Inc. was established in Airlie Beach to engage the community to protect the precious marine life and aquatic environment of the Whitsunday Region. This was initially undertaken with the Whitsunday Marine Debris Removal Program to remove marine debris from the highly impacted beaches of the Whitsunday Islands. It now also includes reducing the amount of debris that enters our waterways through the Clean Streets and Creeks Program as well as responding and caring for sick and injured marine turtles at the Whitsunday Turtle Rescue Centre. Eco Barge also undertakes education and awareness activities within the community concerning the issue of marine debris, the importance of thoughtful waste disposal and what should be done in the event that a sick or injured marine turtle is encountered. Eco Barge Clean Seas Inc. is a not-for-profit organisation with a passionate and dedicated committee, 55 members and a register of over 950 volunteers. Libby is dedicated to protecting and preserving our marine environment for future generations. 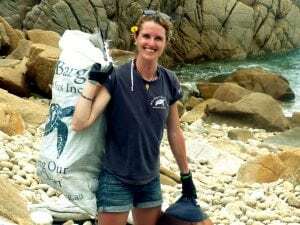 She established Eco Barge Clean Seas Inc. after realising the devastating effects that marine debris was having on the local marine life. Fiona moved to Australia from the UK in 2011 after completing her bachelor’s degree in Oceanography and Physical Geography. Fiona is passionate about protecting the environment, caring for marine turtles and loves organising volunteer events to help make a difference in our iconic region. Eco Barge would not be where it is today without our band of passionate and dedicated volunteers. All the hard work put in to remove marine debris and litter and care for the turtles is done by these amazing individuals and without them Eco Barge would not exist!